Today, many Americans face the possibility of retiring at a much older age than previous generations. 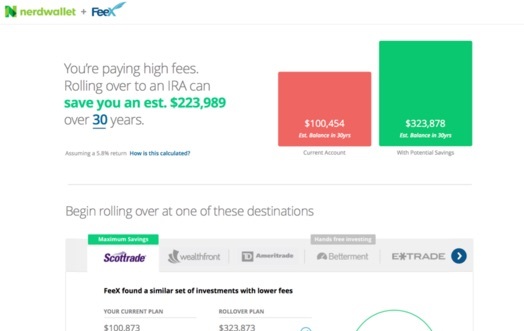 To help consumers take control of their retirement, NerdWallet has launched its own retirement calculator as well as a 401(k) fee analyzer in partnership with FeeX. With the tools’ personalized recommendations, NerdWallet users can create a roadmap to reach their long-term financial goals. Retirement fees can cost median-income two-earner families an average of nearly $155,000 over a lifetime, according to a study by public policy organization Demos. And some 30% of Americans fail to roll over old 401(k) plans into new retirement vehicles, according to a survey by ING Direct USA and Harris Interactive. Through our new 401(k) Rollover Center, delivered in partnership with FeeX, NerdWallet users will have the ability to uncover hidden fees, compare potential savings from rolling over their 401(k), and choose investment alternatives. To get started, users answer a few simple questions, such as their former employer’s name, the investment firm that holds the account, and the type of investment funds in the account. Within minutes, FeeX analyzes the fees and delivers a cost comparison of the existing account and investment alternatives. Consumers will be able to see how much they pay in annual fees and, depending on their retirement age, their potential savings if they roll their 401(k) funds over to an alternative investment. The service is free to all users and does not require sensitive personal identifiers. 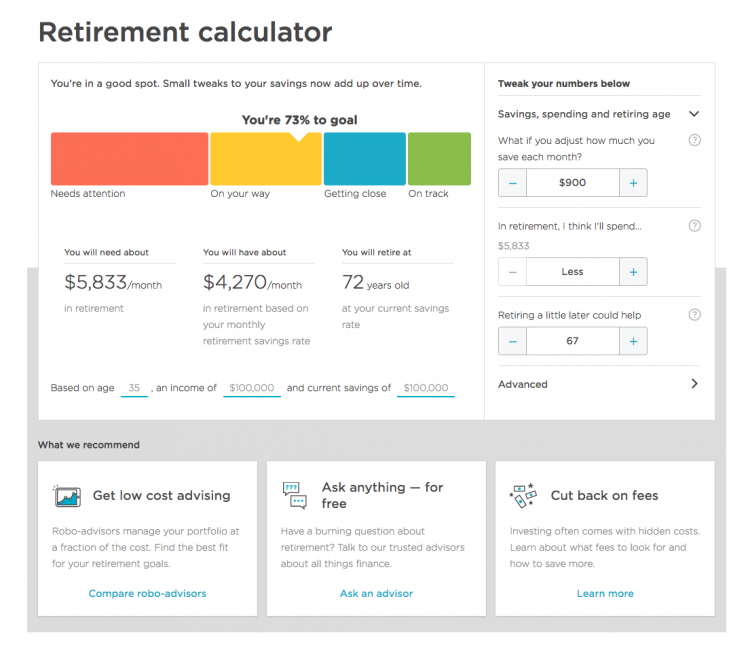 NerdWallet is also introducing its retirement calculator, which gives Americans a clear picture of their retirement savings, suggests next steps based on their needs, and offers access to expert advice through the company’s Ask an Advisor platform. By providing some basic information — such as age, when they expect to retire, current income, retirement savings and contributions — users can see where they stand with regards to their retirement goals. Through an interactive interface, NerdWallet estimates how much a consumer should save monthly if he or she wishes to comfortably retire at various target ages. Consumers will also be able to connect to NerdWallet’s trusted community of advisors, who can answer questions related to retirement. The tool and access to experts are free.